If there is a team that looks as good any for the Barbados Premier League when the new season rolls around in the latter part of this year, it is Deacons Football Club. 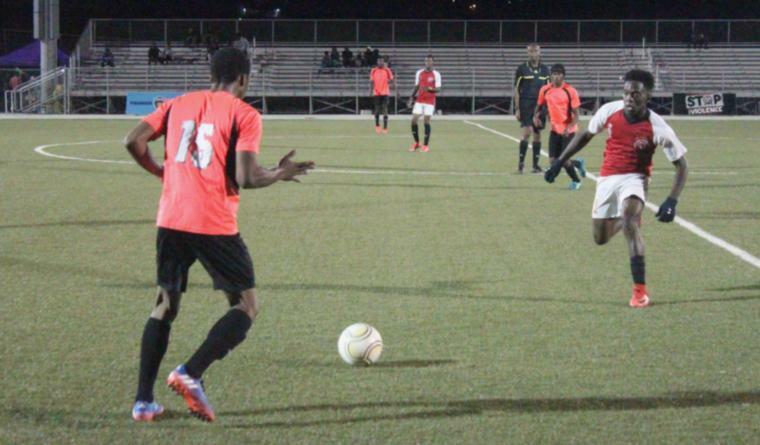 The boys from the Farm continue to keep a stranglehold on Zone 1 of the Barbados Football Association's Division 1 competition and should be a sure-shot for promotion to the big leagues. With the tournament continuing this week, Deacons brought their points up to 22 after a sound 2-0 win over Central League Spartans. Playing at the Wildey Turf on Wednesday night, they racked up their seventh win off goals from Ricardo Carter (69th) and Shaquon Haynes (85th). Silver Sands FC provide the nearest challenge with 18 points after five wins, three draws and three losses. However, Deacons are ahead of the curve with one draw and three losses in addition to their seven wins. Zone 2's Blackspurs have kept themselves in the running for a spot in the top-tier after knocking down Haynesville a peg with a 2-0 victory in the other game at the Turf on the night. It was an open and shut case as both goals came in the second half. Raheem Westfield opened in the 50th while Malcolm Stewart came home late in the 93rd to seal the deal. Blackspurs are now in second in the group with 18 points from five wins, three draws and two losses. They sit behind the runaway train that is Wotton Football Club. The Christ Church side are the only unbeaten side left in the competition with 22 points from six wins and four draws. Earlier in the week, Silver Sands dropped points that could have seen them into the lead in Zone 1, even if only for a short while. On Monday at the Wildey Turf, they went down 1-0 to the Barbados Defence Force after a goal from Jelani Bruce in the 30th minute. The other game on the night saw the sides splitting the points as Bagatelle SSC and Whitehall Titans broke even with a goal each. Whitehall drew first blood in the 14th through the efforts of Shakir Harewood. However, Marlon Headley found the equaliser in the 67th to ensure the draw.